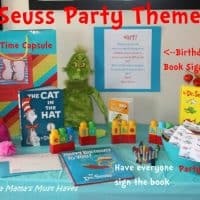 We had Danika’s 4th Birthday Party here a couple of weeks ago and I love to come up with all the party themed decor and games. Since our theme this year was Minnie Mouse I had to come up with Minnie Mouse Birthday party games. Of course the old standby party game is pin the tail on the donkey. 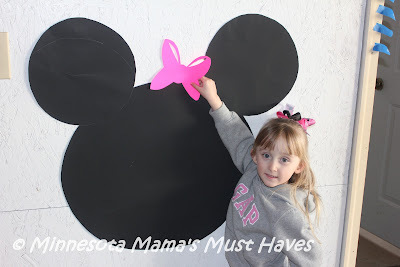 I adapted that idea to a “Pin the Bow on Minnie Mouse” game. The kids loved it and it was easy peasy! Get 2 pieces of black posterboard and cut out a big round circle from one piece and two smaller circles for the ears from the other piece. Use a compass to make your circles or a lid of a bowl. You will also need one hot pink piece of posterboard to cut out the bows. Make sure you have enough bows for each child at the party to have one. My husband came up with the “blindfold”. He took a pair of safety glasses and duct taped them so the kids couldn’t see through them. This was nice since we didn’t have to tie anything around the girls heads and pull their hair in doing so. Make sure you write each child’s name on the bow! Put a piece of folded tape on the back. Blindfold the kids and spin them around before letting them pin the bow. Closest one to the center of Minnie’s head wins! This is a great idea for any theme of party you might be doing. You can adapt it to whatever kind of party you want. Just make the character’s head out with posterboard and pin a part! Our friends did a party this past weekend and adapted my idea to their Hello Kitty party theme. They created her head with white posterboard and made yellow noses to pin on her. It was adorable. « JumpSport iBounce Kids Trampoline Review AND Giveaway!!! 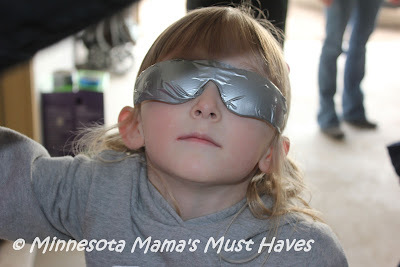 What a great idea on the DIY blind fold! Your hubby is pretty handy. 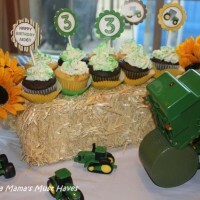 I think I'm going to have to borrow that idea for the next kids party.. And Happy Belated Birthday to your little one! I love this! 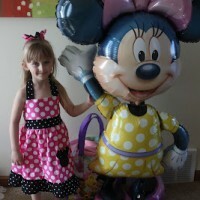 We are throwing my daughter a Minnie Mouse party for her 3rd birthday this summer, and I will definitely be doing this! very creative. love minnie mouse! I wish I would have seen this post a few months ago. I had a Minnie mouse bray party for my daughter, this would have been a fun game to have!! I love both ideas! 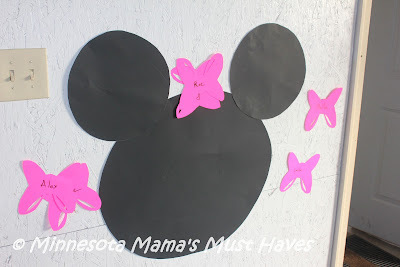 I’m planning a Minnie Mouse themed party for my daughter and will definitely try them out! Thanks for posting this. Do you have a template you used for the bow? I am terrible at free hand drawing and could really use a template. 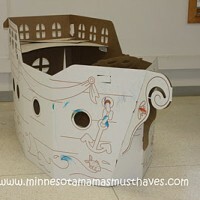 Love this idea it will be so fun for my daughters 2nd Birthday Party! I wish I would have read this last month! we had a mickey/batman bday party for my 2 year old! I would have loved to make this for the party! cool ideas! 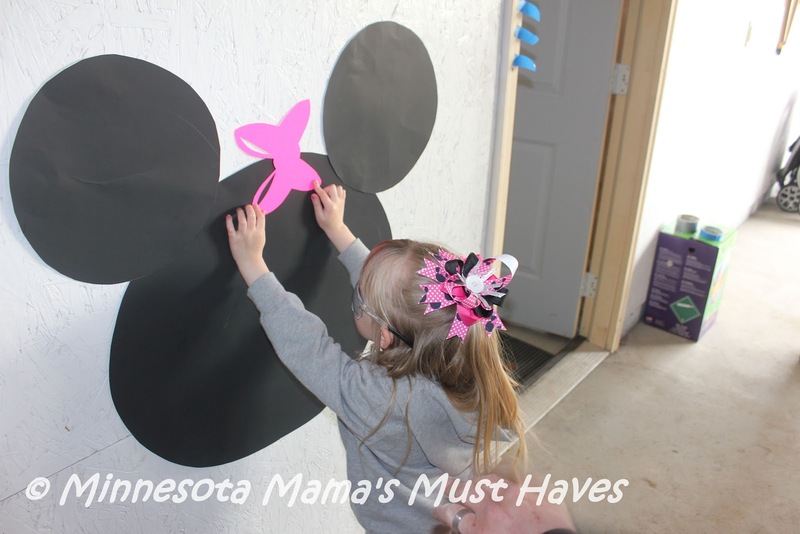 I’m a huge Minnie Mouse fan and I’ll be hosting a Minnie Mouse party for my little girl this summer. Thanks for the fun idea! Thanks for idea trying this saturday. Thanks for sharing this. I’m planning a Mickey and Minnie themed Disney Side @Home Celebration and would love to have this game. However, I’m scared of spoiling the walls. Can you please let me know how did you attach the poster to your wall ? if If I use double sided tape for the bows will they leave marks on the wall if the kids end up sticking on the walls instead of the poster ?